Moscow : A top official of Russia’s Roscosmos State Corporation for Space Activities (Roscosmos) yesterday affirmed the agency’s readiness to hold a joint space flight mission with Bahraini astronauts. Roscosmos is a governmental agency responsible for the space flight and cosmonautics programme for the Russian Federation. Head of the Roscosmos said the agency attaches great importance to cooperation with Bahrain, stressing his readiness to develop astronauts from the Kingdom to participate in one of the joint space flights with Russia. 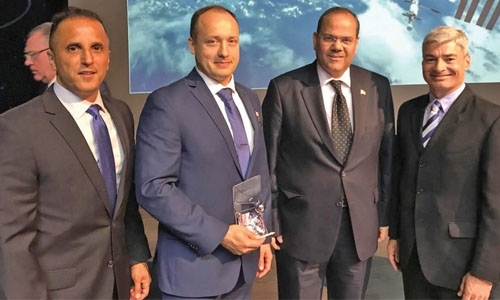 This was announced as Ambassador of Bahrain to the Russian Federation, Ahmed Abdulrahman Al Saati, participated in an official ceremony held by the Roscosmos on the occasion of the return of the Soyuz spacecraft. Soyuz has returned from its 54th expedition to outer space that lasted for 186 days, which carried a Russian cosmonaut and two astronauts from the United States of America. Speaking on the occasion, Al Saati said that the Kingdom is looking forward to signing a cooperation agreement between the National Space Science Agency of Bahrain and the Roscosmos in the coming period. He also expressed Bahrain’s appreciation for the Russian space station’s astronauts for sending a congratulatory video and audio from outer space to His Majesty King Hamad bin Isa Al Khalifa, marking the Kingdom’s National Day and the Anniversary of His Majesty the King’s Accession to the Throne. This, Al Saati said, reflects the outstanding relations between the two friendly countries in various fields.